They are nihonium (with the symbol Nh), moscovium (Mc), tennessine (Ts), and oganesson (Og). Until now, the quartet have been referred to simply by the number of protons in each atom – 113, 115, 117 and 118, respectively. The new names and symbols have been updated in the Karlsruhe Nuclide Chart. 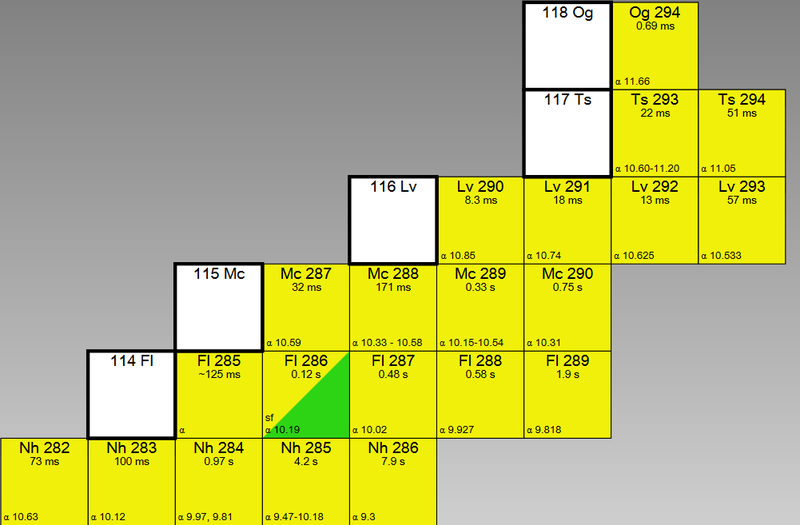 Excerpt from the Karlsruhe Nuclide Chart, showing the location of the recently named nuclides (Elements 113, 115, 117, and 118). Nihonium references the Japanese name for Japan. The atom was discovered at the RIKEN Nishina Center for Accelerator Science. Moscovium was named after the Moscow region, the location of the Joint Institute for Nuclear Research in Dubna. Tennessine recognises the US state of Tennessee and the local contributions made to the discovery by the Oak Ridge National Laboratory and Vanderbilt University. Oganesson honours the nuclear physicist Yuri Oganessian, who has played a leading role in the search for new elements including the one that will now bear his name.